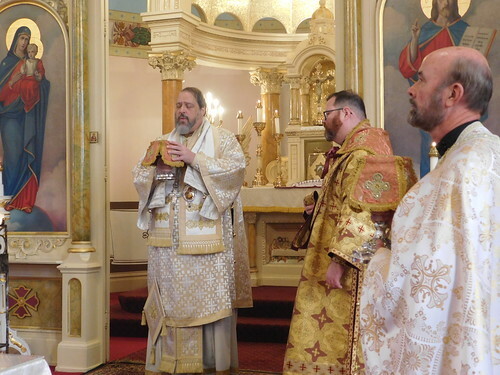 His Eminence, Metropolitan Gregory made an archpastoral visit to St. Michael the Archangel Orthodox Church in Rankin, PA for their 110th anniversary celebration. This was his first visit after the retirement of Fr. 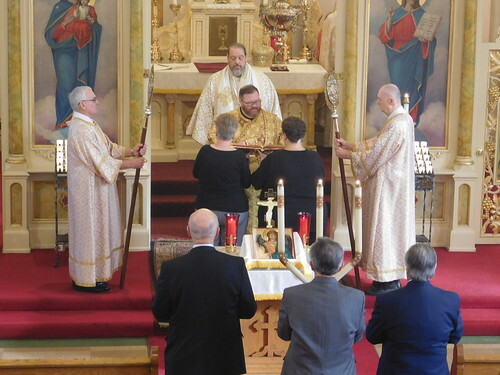 John Lazerek and the appointment of Fr. Nicholas Ferencz as pastor. 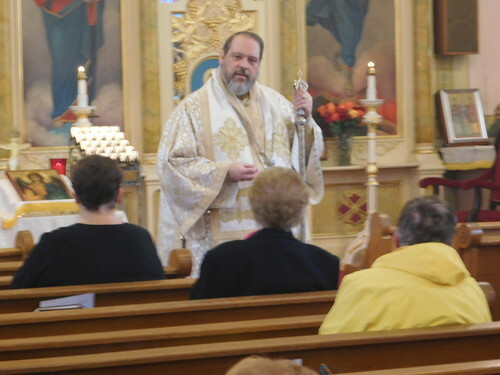 Fr Nik has deep roots in the parish. Both sides of his family originally immigrated to the Rankin area; his mother attended St. Michael's until marriage; one of his paternal cousins is a current member of the parish; and his paternal grandfather is buried in Monongahela Cemetery. 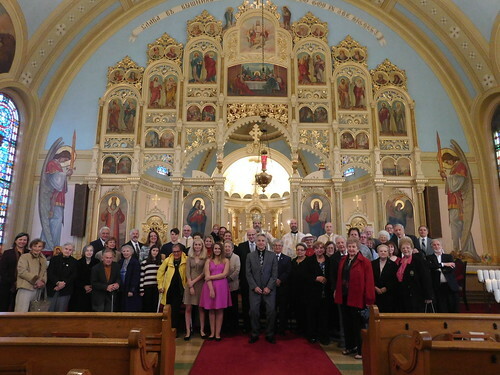 Of the 149 Western Pennsylvania parishes established by Carpatho-Rusyns immigrants in the early 20th century, St. Michael's is blessed with one of the few well-preserved predominantly original interiors. 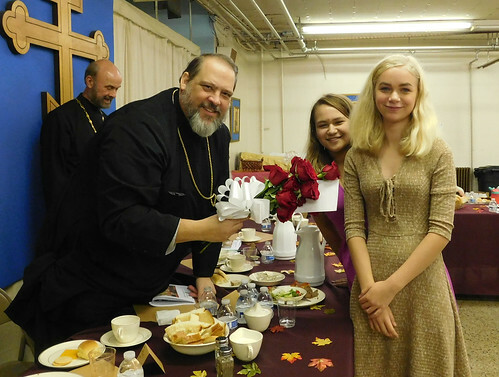 Following a parish tradition for decades, a 110th anniversary booklet, focusing on activities since the 105th anniversary, was provided at the banquet. 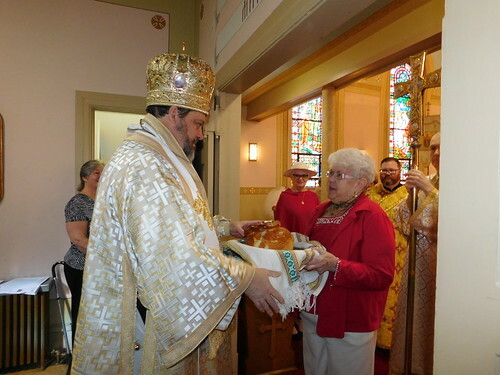 Parish council president is Carole Bushak greeted His Eminence with the traditional bread and salt. Pastor Fr. Nicholas Ferencz greets His Eminence. His Eminence's homily focused on details of Jesus' healing of the sick and raising of Lazarus. Great entrance with Father Deacon Mark and Father Nik. His Eminence asked everyone to come forward for a group photo. Son of the parish, Fr. 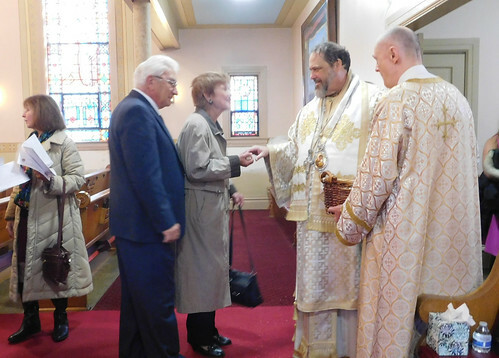 Michael Miklos was unable to attend, His Eminence spoke with his sister Patty Vargo while distributing the antidoron after the service. Flowers were presented by Briana and Jennifer. 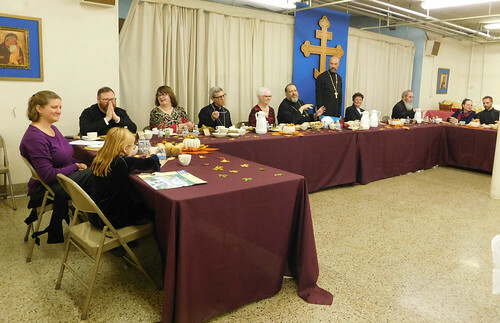 The head table included all of the Pittsburgh Deanery pastors and paňis. 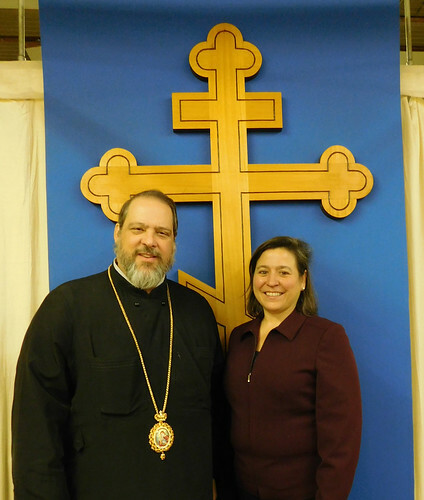 His Eminence had an opportunity to meet Valerie Gaydos, newly elected to the PA House of Representatives, and granddaughter of Fr. Stephen Varzaly who served St. Michael's for 25 years.